ON DAYTONA BEACH, FLORIDA, Blue Bird established a record of 272·11 miles an hour on February 22, 1933. This car was equipped with a Rolls-Royce “R” type Schneider Trophy engine which developed about 2,500 horse-power. The surface and visibility were bad on this occasion. The speed was improved upon, though by less than five miles an hour, during an attempt at Daytona in 1935. IN few fields has the engineer a greater opportunity of demonstrating his genius than in that of record breaking. There will always be a daring band of adventurous men who are willing to risk their lives in attempting to improve on some existing record; and it is to be hoped that there will always be engineers who are skilled enough to design the machines which will enable them to break those records in safety. The breaking of records is real pioneering. It involves the achievement of something that has never been done before, and entails much work of a truly experimental nature. One of the most spectacular forms of record breaking, and one that demands more skill from the engineers and designers than most, is that which is inseparably bound up with the name of Sir Malcolm Campbell and his famous Blue Bird. The world’s land speed record, since 1924, has been broken again and again - in many instances by amazingly broad margins - and the progress which has been made is a fitting tribute to the skill of the automobile engineer and the band of workers who co-operate with him. In 1924 Sir Malcolm (then Captain) Campbell touched a speed of 146·16 miles an hour. No other man, at that time, had travelled at such a speed on land. To-day, higher speeds are frequently attained in the course of ordinary motor racing over road and track circuits. 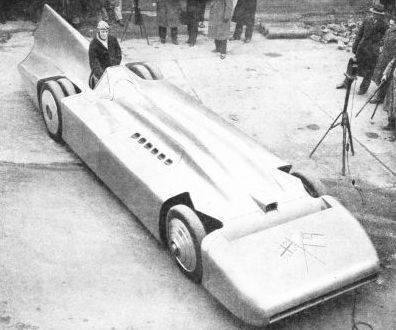 The land speed record, early in 1937, stood at the amazing figure of 301·129 miles an hour - more than twice the speed which had gained the record thirteen years before. The record was taken over the measured mile, and was the average of two journeys in opposite directions. All attempts in motor vehicles on the mile record are judged in this way. The object of the two-ways test is to prevent a competitor from taking advantage of a favourable wind. The first car of the Blue Bird series was built in 1926. A long story of redesigning, rebuilding and modification has led up to the perfection of the existing car: yet the modern Blue Bird does not represent the designer’s ideal of a perfect car for the breaking of records. So surely have the improvements been made, however, and so consistently have they proved the engineers to be working on the right lines, that the 1935 Blue Bird may be justly regarded as a masterpiece of engineering technique. The factors which confront those concerned with record-breaking work are numerous and of great complexity. First, and most serious, is that of expense, A complicated piece of machinery has to be built for a special purpose, and for that purpose only ; it will probably be useless for anything else. When the land speed record is to be attacked, a run with a duration of a few seconds will entail an expenditure which may seem to be out of all proportion to the achievement. The next unpleasant fact to be faced by the designer and the driver of the car is that nowhere on this earth is there a place entirely suitable for a record-breaking attempt at such speeds as can now be attained. The difficulty of breaking a record increases enormously as each new record is set up, and new factors, such as that of finding a track suitable for the attempt, confront the pioneers of to-day. The first Blue Bird had a Napier engine developing 450 horse-power. In 1929 the car, somewhat modified, was equipped with a 900 horse-power engine and taken to South Africa, where, at Verneuk Pan, Campbell attained a speed of 218 miles an hour over the measured mile. 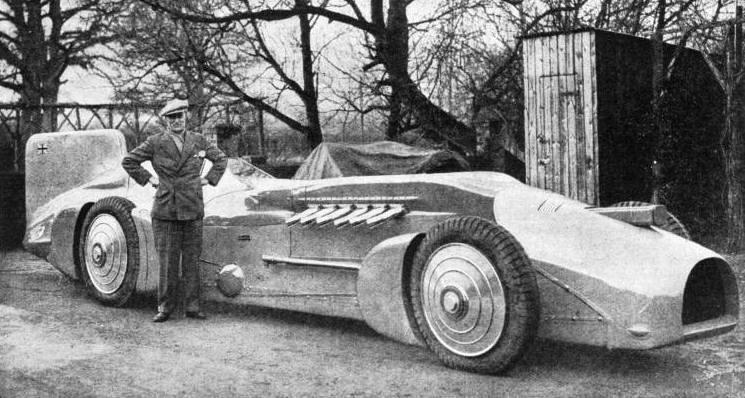 At the same time the late Sir Henry Segrave was at Daytona Beach Florida, USA, with his Golden Arrow, and in it he established a new record of 231 miles an hour. Early in 1930 Campbell determined to attack Sir Henry Segrave’s record. Campbell decided to use the supercharged Napier racing engine developed for the Schneider Trophy seaplanes. This engine developed 1,400 horsepower; and to use it in the existing car meant considerable modifications to that car. The position was one which has occurred again and again. It would to-day be possible, given the money, to design a car which would travel at higher speeds than those attained by the latest Blue Bird. The car would be designed as a complete record-breaking machine; the engine, chassis, body and all components would be designed with that end in view, and no other. In such circumstances, however, the engine would account for about three-quarters of the total cost. In other words, if a chassis and body could be built for £10,000 - a reasonable figure for these modern record attempts - the engine would cost £30,000. The total price would at once class the project as an engineer's dream of perfection. THE problem which always confronts the designer is that of making a car suitable for the best engine available at the time; and such an engine has invariably been of such a size that the car has had to be considerably bigger than the designer’s ideal car. The problem with which the designer was faced in 1930 was even more complex - it was that of making the chosen engine fit into an existing car, still leaving room for the driver. The work was undertaken by Mr. Reid A. Railton, who was also responsible for Blue Bird in its later form. The best course would have been to build a new car round the new 1,400 horse-power engine, but the money available was limited, and Campbell was determined to attack the record during the following January. Thus it was essential that the old car should be rebuilt. In the end, it appeared that the only important unity to survive were the frame side members, the front axle and brake gear, and the steering gear - but their use in the modified car made it possible to be ready by the appointed time. One of the most important requirements was a body with a reasonably low wind resistance. To achieve this it was necessary to find room for the driver to sit as low as possible inside the frame. The problem was solved by the ingenious process of “off-setting” the propeller shaft. The familiar tunnel along the rear floor-boards of many modern cars accommodates the central propeller shaft. The problem of body shape was largely dependent upon that of the cooling system, as the radiator was to be at the front end of the car. The possibility of dispensing with the radiator altogether was considered, but it was decided that it could be mounted in such a way that it would add little to the drag of the body. SIR MALCOLM CAMPBELL and Blue Bird in 1933, before leaving England for Daytona Beach. The peculiar frontal appearance of the car is due to the cooling system used, the radiator cowl being mounted in such a way that the air passing through the radiator could emerge at the rear of the cowling, offering little resistance to the main air stream into which it passed. 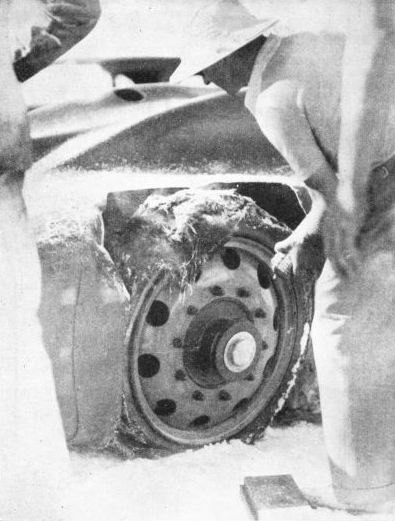 The car is seen fitted with ordinary tyres; those used for the record attempts had no tread. The scheme of mounting the radiator on outriggers, some feet in front of the nose of the car, was next considered; tubular supports for the radiator could also be used as water passages. This scheme, however, was abandoned, and a compromise was adopted. The radiator was mounted some ten inches in front of the nose of the car, and was fitted with a cowl or “false nose”, set at such an angle that the air which passed through the radiator and emerged from the rear end of the cowling offered the least possible resistance to the air stream flowing over it. Wind-channel experiments showed that such an arrangement could be designed to increase the total drag of the body by not more than five per cent. This radiator design necessitated the use of a blunt bull-nose on the body, and this, with the seating requirements already discussed, decided the general shape of the body. More wind-channel tests were made. A one-tenth scale model of the chassis was made, and on it were mounted dummies of all the parts which could have any bearing on the shape of the finished body - including the driver’s body and head. The model was filled in with “Plasticine”, which was moulded down into a streamlined shape until all the salient points were just submerged. Representing the radiator block was a piece of wire gauze, which had been found to offer the same air resistance, in proportion, as the finished radiator block. Wind-channel tests carried out on the complete model showed that there was every hope of breaking the existing record, and the full-size body drawings were taken from the model. Aluminium panels were used. THE car was taken to Daytona Beach, and on February 5, 1931, a new record of 245·73 miles an hour over the measured mile was established. 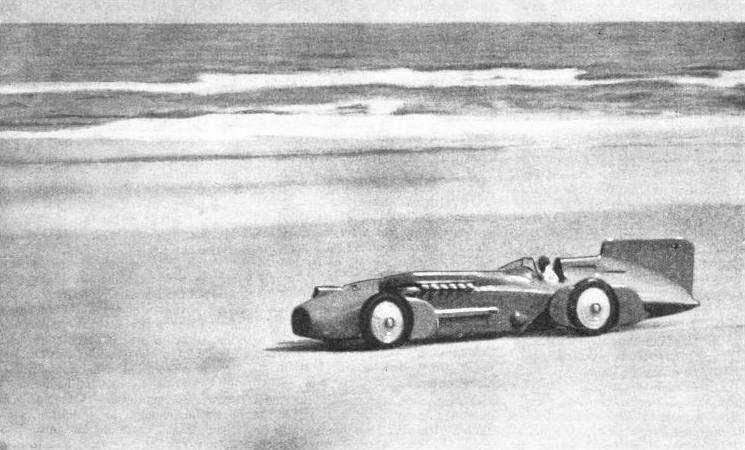 The beach was in bad condition at the time, and Campbell, confident that the car was capable of even better speeds, decided to make another attempt in the following year. Little was done to the car in the meantime. As the temperature of the water in the radiator had not exceeded 60° Centigrade on the previous record run, it was decided that the size of the radiator block could profitably be reduced, and, with the smaller radiator, the body shape was somewhat improved. On February 24, 1932 - again in unfavourable conditions - Campbell set up at Daytona Beach a new record of 253·97 miles an hour for the measured mile. His speed with the wind was 267·5 miles an hour, and, against it, 241·8 miles an hour. This shows the tremendous effect of the wind at these high speeds, even with a carefully streamlined car. In April 1932 it was again decided to equip the car with a new engine - the Rolls-Royce “R” type - which developed some 2,500 horse-power. The designer remarks that the previous task had been a matter of putting a quart in a pint pot, but this meant putting in half a gallon. The wheelbase had to be lengthened to accommodate the new engine; the whole transmission system had to be modified to stand the greatly increased power output; yet drastic alterations involving the spending of much time and money could not be permitted. The total height of the new engine was considerably greater than that of the Napier engine, and this necessitated considerable alterations in the body line of the car. It was now necessary to raise the driver's seat to give him a clear vision ahead. The existing body was so modified that the cylinder blocks of the engine appeared as excrescences on the top of the bonnet, merging off into the familiar contours of the old body. The wheelbase had to be lengthened by 17¼-in, and two new frame members were required. The road springs and shock absorbers had to be strengthened and additional ballast had to be carried to provide the increased adhesion necessitated by the more powerful engine. IMPROVED STREAMLINING was achieved by the design of the bodywork for the 1935 Blue Bird. Pairs of twin rear wheels were used, the rear fin was reduced in size and the radiator was completely redesigned. The flap along the front edge was closed during the run over the measured mile, to reduce air resistance as much as possible. A factor which had always been of great importance was now assuming really formidable proportions. This was the question of wheel spin at high speeds. Daytona Beach presented a surface that was far from perfect, and yet it was apparently the only convenient stretch of land on which these record attempts could be carried out. Although the speed over a measured mile was the prime consideration, it was necessary that ample room for the initial acceleration and the final braking should be provided, and the length of the stretch of sand at Daytona was favourable from this point of view. In January 1933 the car was shipped to America once more; but when it arrived the condition of the beach was even worse than it had been during the previous runs. Campbell had been repeatedly warned by the designer of the car that the tremendous power output of the new engine, and the consequently small margin of adhesion, would make it distinctly hazardous to attack the record unless the condition of the beach were perfect. Campbell waited patiently for more than three weeks. On February 22 the conditions were described as “reasonable”, although the beach was wet and strewn with shells. Patches of mist reduced the visibility to less than half a mile. In spite of these adverse conditions, however, Campbell took the car out and established the new figure of 272·11 miles an hour. The tremendous losses caused by wheel spin were now apparent, since the revolution indicator at one moment had shown a reading of 4,000 revolutions a minute, corresponding to a speed of no less than 370 miles an hour. The car had to be stopped for wheel changing at the, end of the northward run, and the tyres were found to have sustained several superficial cuts. The tyres represented one of the most difficult problems concerning the car; at an engine speed of 4,000 revolutions, the rear tyres were turning at about 3,300 revolutions a minute. The tyres were rolling over a distinctly abrasive surface, and were sustaining a load of nearly one and a half tons, but their performance was beyond criticism. Tyres designed for work of this kind have no tread at all; it would at once be thrown off by centrifugal force. The rubber was but one thirty-second of an inch thick, with the usual layers of cord underneath. So great is the centrifugal force at these high speeds that should one of the outer layers of cord be cut during a run, the broken ends would fly out radially and cut through the rubber. A COMPROMISE had to be struck between excessive weight - which meant high stresses on the tyres - and insufficient ballasting, which meant wheel spin. The load was adjusted by lead weights carried inside the main frame members, inside the tubular cross members and in all other convenient places. About 1,500 lb of ballast of this kind were carried. In spite of this, it appeared that the adhesion was not sufficient, and the wheel spin set a limit to the speed of the car. The design of the car which set up this record in 1933 was an enormous advance on that of the earlier cars of the series. The familiar vertical fin on the tail had been provided, to give lateral stability, but it introduced a problem of its own. Any attempt at making the steering of the car more stable by fitting such a tail fin must result in greater sensitivity to the effects of a side wind, and another compromise became necessary. The car was heavy enough to be slow in its reactions to disturbing forces, and was therefore safer than a lighter car would have been. The better the body shape of such a car, the leas work has the driver to do in keeping it on a straight course. The normal reaction to air pressure tends to depress the nose of the car, and the corresponding elevation of the rear portion reduces the adhesion. All these factors were carefully balanced against one another, and the results obtained leave no doubt that Blue Bird was as safe a car as it could possibly be in the circumstances governing its design. DIRECTIONAL STABILITY was greatly improved by the large vertical fin at the rear of the car. Side winds, however, proved somewhat troublesome, and when Blue Bird was redesigned for the record attempt in 1935 the fin was reduced in size. This illustration also shows the almost vertical position of the steering wheel and gives an impression of the small driving cockpit. The design of the chassis frame was perfectly normal throughout. The designer stated that the general conditions in which it had to function were no more arduous than those faced by the ordinary 3-tons lorry, and the extremely short life required of working parts such as driving shafts enabled a lower factor of safety to be used than would be stipulated for an ordinary vehicle. The fact that the general design of Blue Bird bears such striking resemblances to that of a normal motor car is a vindication of the statement that record-breaking is of real value to the designer of a car to be used for more ordinary purposes. Apart from the Rolls-Royce Schneider Trophy engine, which, admittedly, bears little resemblance to that of a modern touring car, the main features of the chassis differ surprisingly little from those of general automobile engineering practice. Even the clutch and gearbox were designed on normal lines. The clutch had nine driven plates of carbon steel, on to which were riveted the fabric linings. It was of remarkably small size, considering the tremendous torque which it had to transmit. The gearbox also was conventional in design, although the forces present were sufficient to give the driver's hand a considerable jar if he made an error in timing his gear-changes. The road wheels were of the disk type, with 10-stud fixing, as used on ordinary commercial vehicles. The rims were turned from ring forgings of nickel-chromium steel because of the high inflation pressure of the tyres - 120 lb per sq in. The overall length of the car was 26 ft 7-in and the overall width 6 ft 11-in. Its height to the top of the cylinder blocks was 3 ft 9½-in, and the total weight was 10,900 lb, or nearly 5 tons. The car carried 28 gallons of fuel, 27 gallons of water and 10 gallons of oil. The rear tyres had a diameter, when inflated, of 37·6-in, and it was calculated that at a speed of 300 miles an hour this would increase to 38·2-in. The fabric section of the tyres was ⅞-in thick, the tyres being nearly all cord, covered with an exceedingly thin sheet of rubber. Such was the Blue Bird which achieved a speed of 272·11 miles an hour in 1933. People were already beginning to prophesy that Campbell had reached the limit, when he decided that Blue Bird should again be rebuilt. The rumour went round that a speed of 300 miles an hour was his objective, and that nothing less would satisfy him. The old car had already proved itself capable of such a speed, but wheel spin had been the limiting factor. O nce again it was decided to modify the existing car and to use the same type of engine. The problem of adhesion was tackled by the provision of pairs of twin rear wheels. The rear axle, having shown signs of weakness, was redesigned. As the two shafts did not emerge from the rear axle casing at exactly corresponding points, one pair of rear wheels was mounted in the chassis at a point slightly farther forward than the other. THE EFFECT OF A TYRE-BURST at speed. The outer covers of the tyres consisted of a fabric section ⅞-in thick, covered with an exceedingly thin sheet of rubber. Centrifugal force at high speeds is so tremendous that should one of the layers of fabric be cut by a stone, its ends would fly outwards, tearing the outer rubber covering to shreds. The radiator and the front of the body were entirely redesigned. The new nose was flatter than the old, and air was admitted to the radiator through a huge horizontal slit. This was equipped with a flap which could be closed from the driver’s seat during the run over the measured mile, thus reducing wind resistance by a considerable amount. The whole of the streamlining was redesigned, the underneath parts now being almost flat. The carburettor air intakes were now mounted at the top of the body, to avoid the possibility of the entry of sand. The tail fin, for directional stability, was reduced in size. In appearance the new Blue Bird bore little resemblance to the older car from which it had been evolved; but the various alterations were regarded only as “minor modifications”. An interesting addition at this stage was the provision of air flaps, with an area of 4 square feet, behind the rear wheels. These flaps could be raised by the driver, and served as air brakes, slowing the car down until the time at which the wheel brakes could be safely applied. Sockets for special jacks were fitted at either end of the frame, to facilitate the quick changing of wheels. Again Blue Bird was sent out to Daytona, arriving in February 1935, and again Campbell was faced with unsuitable conditions. On some days the tide and wind were favourable, but the surface was in bad condition; on days when the surface was better, tide or wind would be unfavourable. On March 7, 1935, Campbell took out Blue Bird and reached a new figure - 276·816 miles an hour - thus beating his previous best by a small margin. He wrenched his wrist rather severely while changing gear, and this proved a handicap in controlling the car during the run and in correcting the skids, which were becoming inevitably associated with Daytona’s surface. Soon after this attempt, however, came the discovery of a new spot for record breaking - the Bonneville Salt Flats, near Salt Lake City, Utah. Here was a surface which would provide greater adhesion than had ever been possible during recent years at Daytona. The designer, driver and mechanics knew perfectly well that Blue Bird was capable of much higher speeds than had been attained at Daytona, and the famous car was shipped to Bonneville Salt Flats in July 1935. After a short trial run on September 2, Campbell expressed himself satisfied with Blue Bird and with the surface, and was optimistic of attaining 300 miles an hour. On the next day the attempt on the record was made, and the outward run over the measured mile was covered at a speed of 304·98 miles an hour. At the end of this run, and at a speed of about 280 miles an hour, one of the front tyres burst, but the tremendous forces involved kept the wheel clear of the ground until the car had slowed down to a speed at which it could be kept under control. Tyres were changed, and the return run was covered at a speed of 298·013 miles an hour. 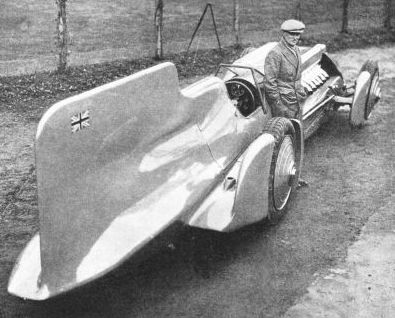 The mean speed for the two runs was 301·129 miles an hour, and Sir Malcolm Campbell had realized his long-cherished ambition of travelling at more than 300 miles an hour. DURING these runs, a small cinematograph camera was installed in Blue Bird's cockpit, to make a continuous record of the instrument readings. The driver had far too much to do in controlling the car to give more than an occasional lightning glance at the dashboard. The chronometer, revolution indicator, oil and supercharger pressure gauges were mounted on a special facia-board illuminated by electric lamps, and the camera was mounted in a cabinet. The new Blue Bird was somewhat larger than its predecessor of 1933, having an overall length of 28 ft 3-in. The record achieved in 1935 still stood in the early part of 1937, Campbell having decided that he would make no further attempts to improve upon his own speeds. The engineers insist, however, that much higher speeds are possible with a car specially designed for the purpose. The problem continues to be that of the interdependent conditions of weight and engine size. An engine of 450 horse-power will propel a car weighing 15 cwt at 200 miles an hour. To increase the speed of the same car to 300 miles an hour necessitates the use of an engine of 1,500 horse-power, assuming that the rest of the car remains unaltered. The necessary horse-power varies as the cube of the speed. The use of a 1,500 horse-power engine, however, means a tremendous increase in weight, apart from the fact that the chassis and body will have to be modified to take it. The frontal area is increased, more horse-power is necessary to compensate for it, and the vicious circle is encountered. The fact that speeds of more than 300 miles an hour have been attained in a car, the history of which has been one long story of modifications and redesigning, is a tribute to the skill of the designer, of the driver, and of all the engineers and mechanics concerned. 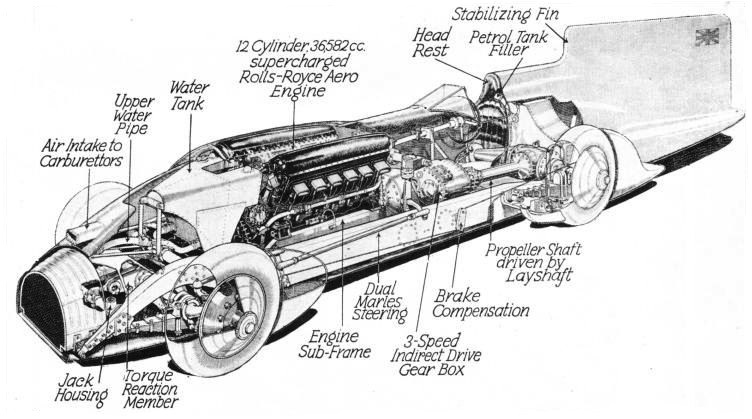 DETAILED DIAGRAM of Sir Malcolm Campbell’s 1933 Blue Bird. The overall length of the car was 26 ft 7-in and the overall width 6 ft 11-in. The total weight was 10,900 lb, or nearly 5 tons. The engine was a twelve-cylinder supercharged Rolls-Royce aero engine as used by planes in the Schneider Trophy Air Race. The car carried 28 gallons of fuel, 27 gallons of water and 10 gallons of oil. You can read more on “Britain’s Streamlined Expresses” and “Hydroplane Speed Records” in Wonders of World Engineering.